Michal Kozupa Grzegorz Kmita, ABB Research Center, Krakow; Roberto Zannol Gianluca Bustreo, ABB Technology Center, Monselice. The acoustic noise emitted by a transformer is often as important a parameter as the device’s power rating, voltage or losses. Novel vibroacoustic analysis techniques and numerical modeling identify design improvements that reduce transformer noise levels. In these times of intense competition in the transformer market, strong product differentiators are essential in attracting the attention of the customer. One area of differentiation is the level of noise that a transformer emits. Industrial noise is classed as pollution. Trans- former noise, due to its harmonic nature, is considered a particularly unpleasant noise pollutant and has, therefore, always been the target of specific design effort in ABB products. Operating deflection shape of 40 MVA transformer tank at 100 Hz. However, the recent appearance of new tools for vibroacoustic analysis have changed the rules of the design game: 3-D scanning laser vibrometry and sound intensity scanning, supported by capable multiphysics numerical modeling, now allow detailed analysis and identification of noise and vibration sources. Furthermore, these tools and techniques also facilitate the design of systems that reduce transformer noise with an unprecedented precision and efficiency. Hum is an inherent transformer characteristic that originates from physical phenomena in the core and windings. In non-loaded transformers, magnetostriction of the magnetic core is the main source of hum; in transformers under load, it is winding vibrations [1,2]. In both load modes, the noise has a harmonic nature, but the modes differ in the frequency spectrum and dominant frequency that is presented.. Though a power transformer’s active part – which is usually immersed in oil – is the origin of vibrations, the ultimate noise radiator is the transformer tank. Improper mechanical design of the transformer, especially the tank, can induce local structural resonances and, consequently, exacerbate noise radiation. A reliable identification of these noise and vibration sources is required if design countermeasures are to be undertaken. One of the best techniques for measuring structural vibrations and operational deflection shape is scanning laser doppler vibrometry (LDV) as it directly measures vibration velocity. LDV measures the Doppler shift created in the reflected laser beam by the vibrating surface. Due to the very high frequency of the laser light (~400 THz), the measurement is precise. LDV is a non-contacting technique so does not influence the device under test and, more importantly, allows measurements to be made from a safe distance on power products, such as high-voltage transformers, that are energized and operating. 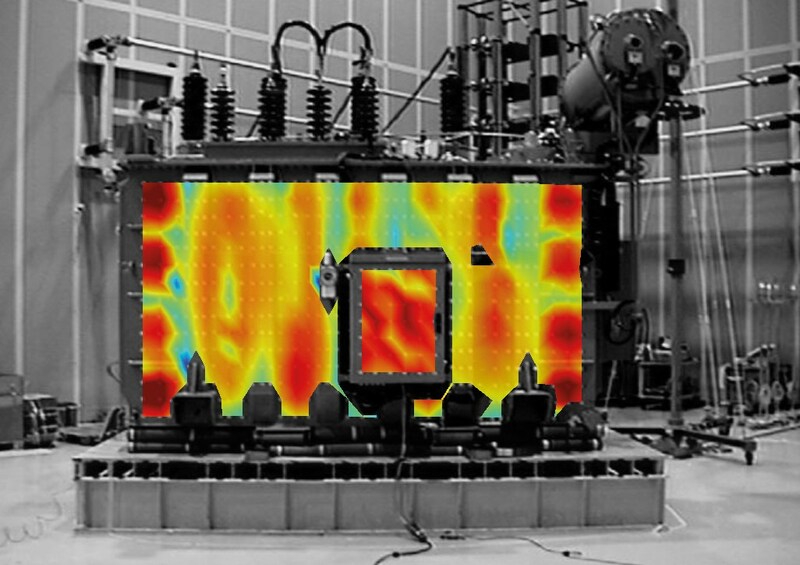 Moreover, in contrast to the traditional accelerometer approach – a slow, lower-resolution method that must take the transformer load situation into account – LDV allows continuous high-resolution 3-D scanning and can deliver thousands of vibration measurement points and detailed deflection data in a very short time.